rick.lang wrote: All right, I'm on PayPay with my US dollar account credit card and have sent the email to SLR Magic in Hong Kong requesting an invoice for the 50mm APO in titanium. Just waiting for them to wake up and see my email! It's just after 7 am in Hong Kong on December 31st so I should be able to just make their promotional pricing since their deadline is the 31st. What? How? I thought that promotion was sold out. ...nevermind: I figured it out. Promotion still good but first batch is sold out. Next batch: ~April. If anyone is confused, by December 31, you need to get an email to support@slrmagic.com committing to purchase the $999 50mm APO lens. They will send you the information to make your PayPal purchase, $100 now and $899 plus shipping fees when it ships on April. That price gets you the titanium PL mount and makes you an early adopter that will receive special pricing on future APO lenses. There's not much time to act. Thanks for the info, Rick. I sent Andrew an email earlier today. I'm down to commit, just need their response. Last edited by Paul Kapp on Tue Oct 03, 2017 6:30 am, edited 1 time in total. Paid via PayPal! On the slippery slope to financial ruin now, just like the rest of you, except worse. Oh well, it's done! Paul, appreciate the lens ****. Now I need to see some 4.6K camera ****! Or 4K... Or Micro Cinema HD! "We will soon offer PL to EF, F, E-mount, and mFT mount adapters as we are unable to test a good one on the market to use with our lenses to maintain good optical quality. We have tested adapters ranging from US$250 to US$1,100. When our adapter is avaliable the price will be US$699 retail price including lens support. We can only ensure good image quality when PL camera or our PL adapters are used. At launch, we will offer the adapter to you at US$400 + postage cost." I use the Wooden Camera PL adapter on my Pocket camera, works great, no issues on either my Zeiss Super Speed, or Angie zoom. I do not know how a mechanical adapter could mess up the optics of the lens, unless it is not correctly shimmed for the FFD, then Focus/witness marks would just be off. I wounded if Andrew is referring to a Speed Booster optical type adapter, rather than just a mechanical adapter, which would (SB) effect optical quality of the lens? Thanks, James. I think the adapters are due to be offered in February 2016 so could be in five to eight weeks. I'll pick it up for $400 just as a form of insurance that the adapter is completely compatible. Assuming the PL->EF works on my Canon EF-S camera. SLR really interesting when it comes to anamorphic lenses. They have no competitors if they'll develop them and sell for price that were announced. APO is okay but in the same price range you can get full set Sony CineAlta 2, which is by default should be better. ...which you must buy as a set. $12,000 up front. No thanks. idk, lenses it's a long term investment. slr looks pretty solid but this is not the most important in the lenses. would be good to see side by side tests with zeiss distagons. Pete, I'm sure that comparison will be done when there are several APO lenses but initially there is only a 50mm with an announced 85mm to follow with a wide lens expected about Photokina 2016. Then more lenses possibly late 2016 and certainly throughout 2017, as the family gains some traction. I'm confidant demand will grow if they manage to keep their siblings under $1,000 US for the aluminum PL mount. Rick, how are you planning on storing and/or transporting your lenses? I'd love a Pelican with laser-cut foam insert, but I'm thinking that won't be realistic until all of the lenses are available and accurate measurements can be made. 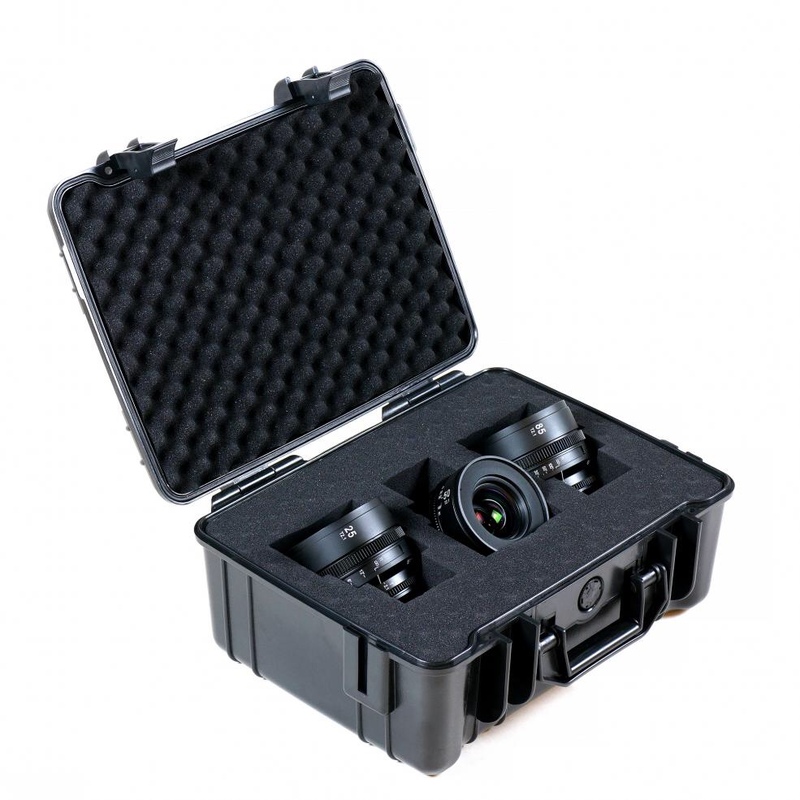 Meanwhile, there are hard case solutions for lenses with adjustable soft inserts and even pouches, such as from PortaBrace, that will probably work, too. I'd like to keep the lenses separate from the other gear. I was actually thinking about this today. The size of the lenses should be identical for the first four lenses which are likely 50mm, 85mm, 24-25mm, 32-35mm. After that size may increase for a 135mm, a 60-65mm macro that John Brawley would like or possibly a 100mm macro, and the widest lens that at this time could be 16mm or 18mm or 20mm. So by the end of 2017, six or seven lenses. That sounds like a custom cut Pelican style case. But when there are only two or three lenses, protective soft pouches in a soft case might do. Realistically, although people talk about lenses getting beat up over time, I would hope to treat my glass like, well, fragile glass and keep it pristine. The traditional six lens foam cutouts and slots for filters may not work though with a seven lens set. I'm concerned about how to carry that macro lens, but I've no assurance that one will even be built. I'll try and get an answer on the future lenses at Photokina 2016 and proceed accordingly. Any recommendations would be appreciated. We have some lovely custom cut foam examples in a thread on this forum. I think the takeaway for me is that a beautiful character with some creaminess is ideal for video. Cooke's have it, but beyond my reach. Hoping the APO will have it too and within my grasp. Wish the use of photography lenses that are continuing to increase their sharpness wasn't quite so prevalent in narrative cinema. The makeup artists who work under these conditions are worth their weight in gold if they can make you look good while the audience is immediately aware of any 'flaws' of which 99.99% of us have in abundance. I like softness. I deliberately soften my images with diffused lighting, filtration, whatever I can do to make the image pleasing and forgiving for skintones. I find it a more filmic look, as well. I like that digital gives me a sharp start, so i can choose how soft I want the image. And i dont mean out of focus. Even if the image only needs to be a little soft...a 1/8 pro mist, for example. Just to take the edge off. Or full black fogal net with 3-strip technicolor luts for that old school feel. The only time i think sharp is appropriate is TV "news" footage or cheap horror. Presumably the deadline for ordering the 50mm T2.1 APO PL prime has been extended to January 31, 2016. If this deadline is for something else, I'll update this thread. Ha! Just noticed the link was for the three ANAMORPHOT CINE primes with case, not the APO spherical primes. I wonder if they'll offer a similar case for the APO Hyperprime Cine lenses once it's a complete set. Could be interesting if there are eventually seven primes including a macro. Maybe eight pockets to include filters. 16/18/20mm, 24/25mm, 32/35mm, 50mm, 85mm, 135mm, 60/65/100mm macro + Vari-ND/IRCut. Too bad we don't know the number of lenses or their dimensions or I could just have one made now and fill it up as I go. 'Padded pocket holder things until the set is done' it is! The length of the macro and 135mm will likely exceed the length of the 24/25, 32/35, 50, and 85mm. The width of the widest lens 16/18/20mm will likely exceed the width of the other lenses depending on whether or not the T stop remains T2.1 or if the aperture is smaller such as T2.8. I don't believe all lenses will be housed with physically identical dimensions. Right. But we certainly won't know for sure until much later. Might be a few years before the set is completed. But, it'll be worth it. 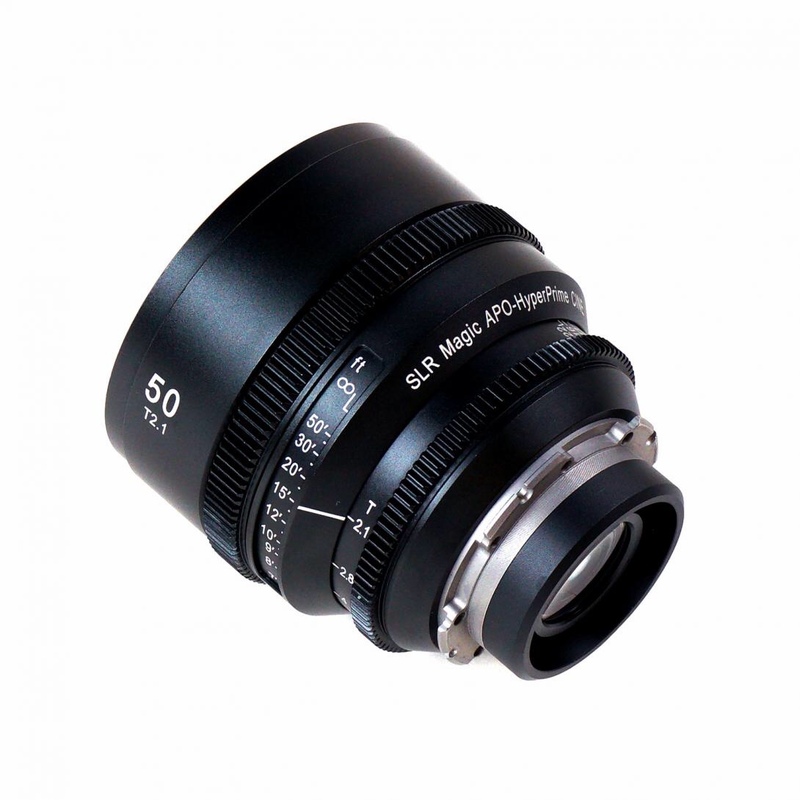 Received an email from SLR Magic informing me the next production run of the 50mm APO PL is ready to ship for preorders if I want the lens now rather than in April. The EF and MFT adapters were due in February, but i asked if they were ready now as well. if the adapters are not ready, I need to wait as I don’t have a way of testing the lens. rick.lang wrote: Received an email from SLR Magic informing me the next production run of the 50mm APO PL is ready to ship for preorders if I want the lens now rather than in April. The EF and MFT adapters were due in February, but i asked if they were ready now as well. if the adapters are not ready, I need to wait as I don’t have a way of testing the lens. I didn't get one of those emails; nobody likes me. You might as well do it since it'll take a billion days to ship from China. Peace of mind having the lens in your possession. Hong Kong, China (Feb 9th, 2016) – SLR Magic is proud to announce the SLR Magic ANAMORPHOT-CINE 1.33x PL lens set for filmmakers which could be adapted to EF/F/mFT/E-mount via adapter. As a commitment to the film industry, SLR Magic developed the SLR Magic ANAMORPHOT-CINE lenses to deliver the classic contrast, distortion, chromatic, color aberration, and flare characteristics of vintage anamorphic lenses, but with the convenience of a matched lens set without the hassle of aligning and matching lenses to the already popular SLR Magic Rangefinder with Anamorphot adapter combination. To achieve the much loved scope aspect ratio, which gives a very pleasant, epic effect, filmmakers must crop off the top and bottom of standard 16:9 footage when using spherical lenses with modern digital cameras. As a result, 25% or more sensor/negative information is discarded. This 1.33x anamorphic lens help filmmakers to maximize their image quality by preventing this loss of vertical resolution. The unique 1.33x squeeze factor uses the entire 16:9 sensor/negative area to achieve the desired 2.35:1 aspect ratio. The SLR Magic ANAMORPHOT-CINE 1.33x does this by compressing a 33% wider field of view to fit the width of the 16:9 sensor/negative without compressing image height. The SLR Magic ANAMORPHOT-CINE 1.33x create a unique “artifact” such as horizontal lens flare, commonly referred to as anamorphic streaks, and may create slightly elongated bokeh. Over the history of cinema, these same stylish effects have contributed to the cinematic “look” of epic motion picture photography. Characteristics that shape this anamorphic “look” come from “front-mounted” anamorphic designs such as the SLR Magic Anamorphot while “rear-mounted” anamorphic designs have more suppressed anamorphic characteristics. Lenses would be on demo at the BVE Expo in London, UK from February 23-25 in the Atomos booth K30. some of the distortion on the wide angles looks a bit too much-- distracting, even. but that can also be a stylistic choice. overall, they look pretty darn good. I think the 35mm lens has the most pronounced distortions on vertical edges like the corners of walls and door jambs. Personally a bit strong and not my cup of tea for that particular lens. But overall I agree, they do seem to produce a decent image. I hope demo videos would roll out once SLR Magic hits BVE tomorrow! The SLR Magic ANAMORPHOT Ciné primes are now available on B&H Photo, 1.33x and 2x, in three lens sets or individually priced. The 1.33x are quite a different lens than the prototypes seen originally. Shorter and lighter but with that 2x mask added to simulate flares of the true 2x ANAMORPHOT Ciné primes. And the 1.33x primes have the titanium PL mounts. The 2x lenses look like the original design although I'm sure there are some differences. Vic Harris has just posted on BMCuser that SLR Magic has added the APO 25mm Cine and APO 85mm Cine primes to make a three lens set available in Q3 2016. I believe that will coincide with IBC 2016 in September. What a lovely set of lenses! I'm ready to start mine with that 50 mil, Andrew! I wonder if we can preorder a set including the case? I imagine Andrew will mention something at NAB 2016. I'm good for a set. And waiting for three more when they're ready. I hope someone with a comparable set of CP.2 primes or similar class of glass will be able to find the time to do a comparison test to the APO lenses. rick.lang wrote: I wonder if we can preorder a set including the case? I imagine Andrew will mention something at NAB 2016. I'm good for a set. And waiting for three more when they're ready. I hope someone with a comparable set of CP.2 primes or similar class of glass will be able to find the time to do a comparison test to the APO lenses. Or rent them and do a test. I am now communicating with SLR Magic asking about preorders for the new lenses. We wish to inform you that your lens will be ready by end of April/beginning of May. The PL to EF mount adapter is probably ready a bit later in May. It then listed the April 15 press release announcing the 85mm and 25mm lenses. As you are one of our pre-order customers for the 50mm APO lens, there will be a special offer for you on these 2 APO lenses as well. The details will be available in May after the NAB show. Someone say hi to Andrew for me if you run into him on the NAB Show floor. Here's my footage though Kofas is much better. The tripod that was provided was way too small and we were also trying out MovCams new remote FF so the footage and technique could have been much better. Just had too much camera right then. A few different looks in there. Wanted to mix it up. All wide open except two shots which were t2.4 or so. 25, 50 and 85 t2.1 APO Glass. First time posting, big fan of all the awesome information provided on the site. Love the look of anamorphic, but for the most part it's always out of reach for us indie filmmakers. SLR Magic Anamorphics look great and affordable, just wondering do you guys think they would be a good fit for my 2.5K EF BMCC or my new BlackMagic Micro Cinema Camera. 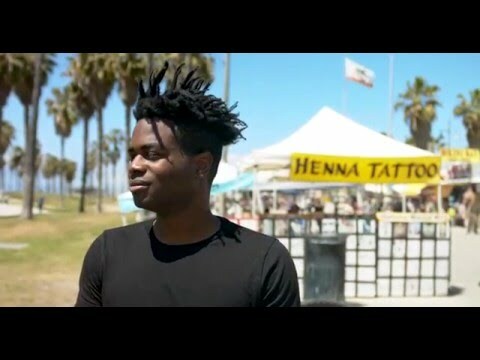 Total newb question but trying to achieve that true 2.35:1 aspect ratio, for short film and music video work. Any help would be greatly appreciated!!!! Read this thread and you should see the SLR Magic 2x ANAMORPHOT CINE prime lenses are designed for MFT and smaller sensors like the BMCC MFT. Here's a video update about future focal lengths. So nice if they can do 18, 25, 32, 50, 85, 135mm and keep the new lenses at T2.1. If the 135mm can't manage it a slower T-stop may be fine since it would tend to be used for exteriors more than interior shots. Even if the 18mm needs to increase the physical dimensions to maintain T2.1, it could become a popular choice. Right. I don't mind the not-often-used lenses on the very short and very long sides being of different physical characteristics, thus potentially having to reset follow focus gears and mattebox, if the performance characteristics match that of the normal or more widely-used lenses. 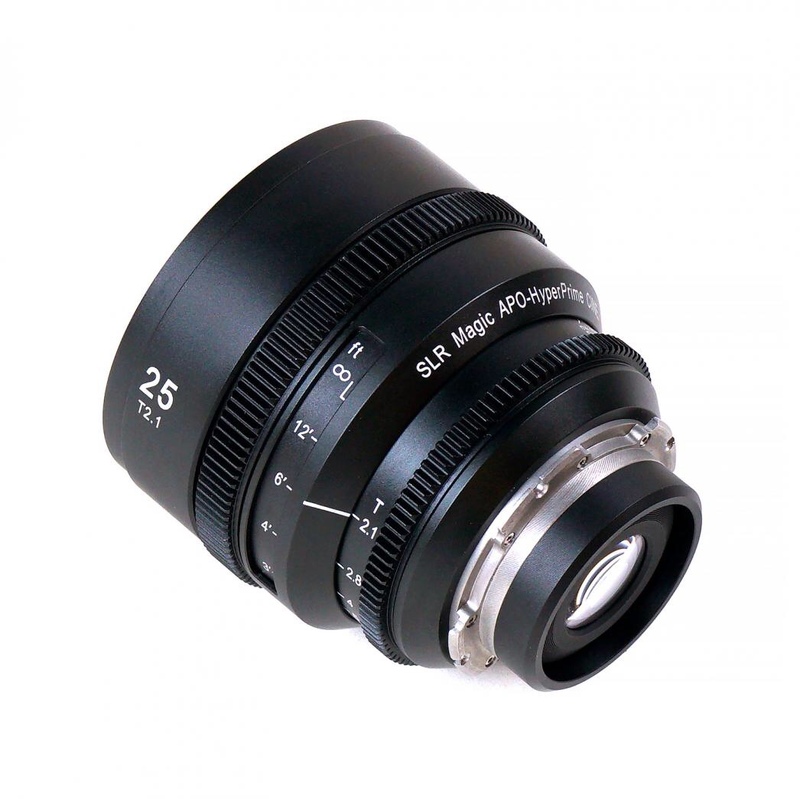 The SLR Magic APO HyperPrime CINE 50mm T2.1 lens in PL mount, and the SLR Magic PL to EF mount adapter are ready. The attached video shows the PL to EF adapter in use. Me too. Very exciting since this lens was actually announced in September 2014! John Brawley's blog gave us the first controlled test of the prototype and this production lens has been both an optical and mechanical improvement. Worth the wait. rick.lang wrote: Me too. Very exciting since this lens was actually announced in September 2014! John Brawley's blog gave us the first controlled test of the prototype and this production lens has been both an optical and mechanical improvement. Worth the wait. The lens isn't even in my hands yet but it's totes worth the wait. And then......the others. 2016 = good year.